2015 Le Miccine, Chianti Classico DOCG, Tuscany, Italy. 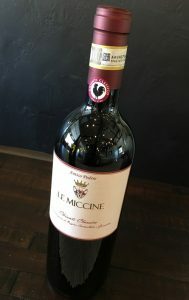 One of Chianti’s rising stars, Le Miccine is crafting some impressive wines and the current Chianti Classico 2015, a Tre Bicchieri winner, is an absolute perfect example of what these Tuscany hillside vineyards are capable of producing with ripe warm fruit, exceptional purity and bright acidity, and with an authentic class. Paula Papini-Cook the highly regarded French Canadian winemaker with Italian grandparents is the one woman show here at Le Miccine, an amazing historic estate in the Gaiole Classico zone and her latest efforts show her gifted touch and finesse with Sangiovese especially though like Castello di Ama, Le Miccine does a single parcel Merlot too, and it’s riveting. Le Miccine follows organic viticultural practices as much as possible, which increases the biodiversity and allows the vines to increase their natural defenses against harmful elements, they are looking for a balance that gives optimum grape quality and respecting the nature of their place. The estate vineyards in this Chianti Classico include the native Sangiovese, of which there are 6 different clones along with Malvasia Nera and Colorino that make up a minor part in the blend, but adds to the depth and complexity in the wine. The crisply fresh Classico is fermented completely in stainless steel tanks with the wine being raised in mostly large cask to highlight the natural vibrancy and transparency, it’s a combination that works great in warm vintages, like this 2015, it gives a vigor and focus to this easy to love and understand Tuscan red. Beautiful detail and precision make this wine awesome with food, it shows a medium bodied palate with layers of plum, tangy cherry, blackberry and cranberry fruits along with minty herbs, mineral tones, cedary spice, anise, tobacco leaf and delicate earthiness. Things get a bit more lush with air adding a creamy feel, while still being well structured and held firm by soft tannins, again, this Chianti Classico from Gaiole in Chianti is best with food, be it rustic or robust cuisine, the meal will allow a deeper personality to show through and it will bring out a touch of floral beauty to the Le Miccine, making it even more impressive, drink over the next 3 to 5 years.